Robin Hood (2010) is a film adaptation, directed by Ridley Scott, of the classic Robin Hood folklore. The film falls under many genres: action, adventure, history, romance, and drama, and carries a darker tone compared to other film adaptations of the English folk hero. The writers of Robin Hood have never explicitly stated where they drew their inspiration from for the film, however, their stylistic choices reveal what sources they may have relied on. One of these is the might be the historical figure of Fulk Fitzwarin, who was notorious in England as an outlaw. Fulk is known to be one of the barons to force King John into signing the Magna Carta in 1215. There is literature detailing Fulk’s life and describing how he worked against King John’s tyranny. Both of these aspects can be seen in the film through Robin Hood’s speech (played by Russell Crowe) to the King (Oscar Isaac) in front of the Barons. In the movie, this speech is what incentivizes people to draw up the Magna Carta for King John to sign. This is an interesting detail in this film, because no other Robin Hood story (to my knowledge) centers the climax on the triumphant signing of the Magna Carta. The speech itself foreshadows western democracy and constitutionalism, focusing on King John’s obligation to recognize that every citizen is equal and to end his rule of tyranny. Historian John Aberth, author of A Knight at the Movies (2003), recognizes two main themes in the early ballads about Robin Hood: “concerns with the abuses of the law and corruption in the judicial system and readiness and unremorseful resort to violence.” Both of these themes are also prevalent in the movie, suggesting that the filmmakers may have read or turned to the ballad literature for inspiration. One such example of an early ballad is A Gest of Robyn Hode, which was written sometime in the fifteenth century, and has many connections to this film. Chiefly, the character of Godfrey in the movie seems to be modeled on the Sheriff of Nottingham in the Gest. In the ballad, the sheriff abuses the law, planning to execute people without a fair trial, which speaks to the first theme that Aberth identified in his book. Godfrey acts in a similar way, killing citizens because they won’t pay their taxes. Furthermore, the second theme, the unremorseful violence, comes in no short supply in the movie, with gruesome battles and deaths occurring frequently. The demise of the Sheriff in the early ballads and Godfrey in the movie also shows how the film could be highlighting this theme found in the literature. In the Gest and in Robin Hood and the Guy of Gisborne, which is another ballad, Robin shoots the Sheriff as the latter is retreating. This scene may also reflect the film’s death of Godfrey, who dies when Robin shoots an arrow through his neck as he is retreating from the final battle. Though these ballads might be an inspiration for this adaptation of Robin Hood, some more modern aspects were brought into the story as well. Robin Hood was not characterized as the “people’s champion” until Martin Parkers’ True Tale of Robin Hood came out in 1632. This is the more well-known character seen today. In the movie, this type of Robin Hood characterization is seen only a few times, when Robin declares to King John that all men should be equal and when Robin robs the rich of their seeds to provide for the suffering people of Nottingham. The latter example may please those viewers who want to see the classic trope common to most Robin Hood tales and films; that is, Robin Hood taking from the rich to give to the poor. 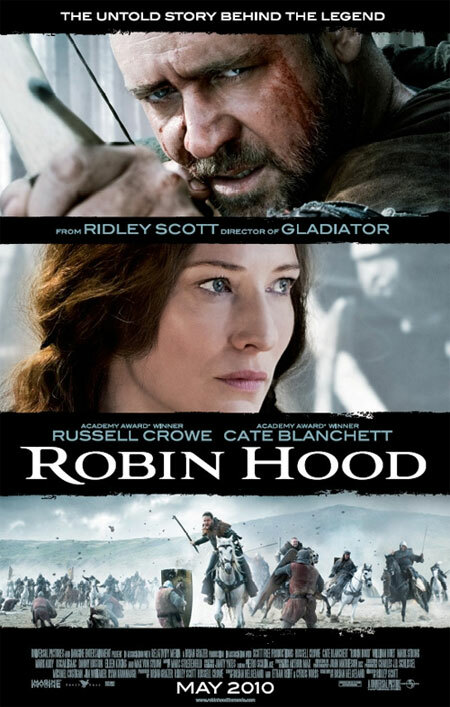 This movie is a good action-filled drama that presents a fresh adaptation of the Robin Hood story, which may have been inspired by historical figures who lived during John’s reign, as well as some of the ballads of the fifteenth century. 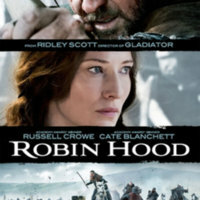 Logan Clair, “Robin Hood (2010),” Medieval Hollywood, accessed April 24, 2019, http://medievalhollywood.ace.fordham.edu/items/show/121.